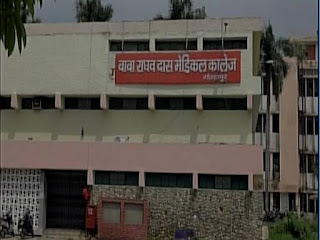 Gorakhpur (Uttar Pradesh) [India] : Amid the growing outrage over the death of nearly 70 children at Gorakhpur's Baba Raghav Das Medical College's Hospital due to encephalitis and alleged disruption of liquid oxygen supply, Dr. Kafeel Khan has been removed as the Nodal Officer for the Department of Pediatrics of the hospital. Dr. Bhupendra Sharma will now take over as the nodal officer of pediatric department, while Dr. P.K. Singh, Principal of Rajkiya Medical College, Ambedkar Nagar, has been given additional charge of BRD Medical College. Earlier in the day, Uttar Pradesh Chief Minister Yogi Adityanath said that he is tremendously affected by the death of over 70 children, while reiterating that a probe will be instigated and the guilty will be severely punished. Stating that Prime Minister Narendra Modi is deeply concerned and has offered complete support, Adityanath said that nobody can be more sensitive than him in the regard. "Nobody can be more sensitive towards those children than me. Prime Minister is very concerned and he assured complete assistance from the Centre. Prime Minister has also sent Union Health Minister J.P. Nadda to take cognizance of the situation," said Adityanath. Tragedy continued to descend upon Gorakhpur's Baba Raghav Das Medical College hospital, as another child succumbed to encephalitis today, taking the death toll over 70 on Sunday. According to data procurred from the BRD hospital, in five days - from August 7 to August 11, a total of 60 deaths occurred in the hospital.